Premiership football at The Valley: We took an American colleague to see some real football, and watched Charlton Athletic beat Birmingham City 2-0. Not the greatest game ever, but an excellent experience and I was pleasantly surprised that tickets were much easier to obtain than I thought they would be. A curry in Brick Lane: Not quite what I was expecting as having dodged the many touts and determined all the curry houses seemed pretty much the same, a local shopkeeper came out to urge us away from the main drag and onto the family owned restaurants in the side streets. The restaurant we ended up at was generally very good, but unfortunately my chicken tikka masala was so mild as to be a little bland. Exploring the South Bank and the City: Strolling down the South Bank from Westminster bridge, into the historic City and St. Paul’s, and then down the Strand made for a lovely Sunday tour of some famous landmarks, and the discovery of a well-stocked second hand book market. 100 Club: Live music in the retro surroundings of an Oxford St basement. From modern culture, we then visited the amazing British Museum. It’s so huge you can never hope to see more than a tiny portion of its many in one visit galleries, so we restricted ourselves to the most famous—Ancient Greece and Elgin’s Marbles and a quick tour of Egypt to see the Rosetta Stone. On my one previous visit I did an excellent “Highlights Tour”, run by one of the most enthusiastic and knowledgeable tour guides I’ve ever met, and even on this second visit, my memory of the first tour made all the exhibits so much more alive somehow. Author Nathan DimmockPosted on 26 January 2006 26 January 2006 Categories General, TravelLeave a comment on Londinium! On the subject of TfL ticket machines, the exorbitant new cash fare structure means the ticket machines that only accept coins are now practically unused: few people carry sufficient coins for even the £3 single fare. Correspondingly, the small number of more useful tickets machines that accept cards and notes and allow one to charge an oyster card always seem to have very large queues…. Nokia mobile telephones have a reputation for being the best on the market, but for a long time they didn’t produce a phone with all the features (tri-band, bluetooth and GPRS) that I required and so I had bought (Sony-)Ericsson phones. Recently I noticed that the Nokia 6230 does have all these features and given Nokia’s aforementioned reputation, I decided to go with the 6230i instead of another Sony-Ericsson. So, after my first week with the phone, is Nokia’s reputation deserved? As usual when switching brands some things are better, some things are worse, and some things which are just different. There’s been a lot of headlines about Web 2.0 recently, and at least one person has asked me: “What does all this 2.0 stuff mean exactly?”. With the dot com “bust” still a recent memory, a lot of people have proclaimed it more Internet-hype—and there is no denying the 2.0 moniker is pure marketing—but if the web becomes so ubiquitous people take it for granted, isn’t a little reminder of how much better things are now than they were in say, 1999, a good thing? Anyway, here’s something which I think sums up why the web deserves a large bump in version number. During the Apple product announcement yesterday, practically every Mac-related website was swamped with traffic, yet I was able to watch a minute-by-minute summary at http://www.macrumorslive.com/ (sadly disabled after the event so you can’t see just how cool it was). Sure, webpages that automatically refresh themselves at a set time interval have been around since web 1.0, but this page didn’t refresh (the whole content), it updated with only the new information: no annoying flicker as the whole page changes, no wondering whether the server will be completely overloaded during this refresh so you’ll have to manually interveve, and it even had a little ticking clocking showing you how long until the next refresh so you knew how much time you could dare to avert your eyes for! It’s a shame there isn’t a demo available, but for the techies amongst you, there are some details of how it works. The January Sales are a wonderful thing: yesterday I picked up a Ferguson R116D DAB digital radio for half price at Dixons. I’ve been considering a digital radio for a some time. 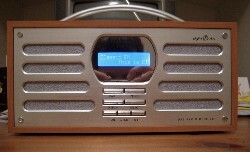 Some people claim the quality is lower than FM and punters would be better off listening via the Internet, or using a Freeview digital television box, but since a good portion of the stations to which I listen regularly (e.g. Virgin and Radio 5) are broadcast on AM-only, it seemed to make sense. I also really like good old-fashioned radio — I can operate it even before I’ve had coffee in the morning, and without the distractions associated with turning on my computer! So far, I am really pleased with it. There are a lot of digital stations available, even in our basement, and overall the quality of the stations we like is pretty good but bizarrely many of the rubbishy commercial ones do seem to broadcast in 96kbps mono — come on people, this is the 21st century!!! While audiophiles criticise DAB for the poor audio quality of many stations, for me this is pretty moot since this is a cheap set with only two 1 watt speakers (but it does have line-out which is missing from many cheaper sets and therefore one of the reasons I chose this one). 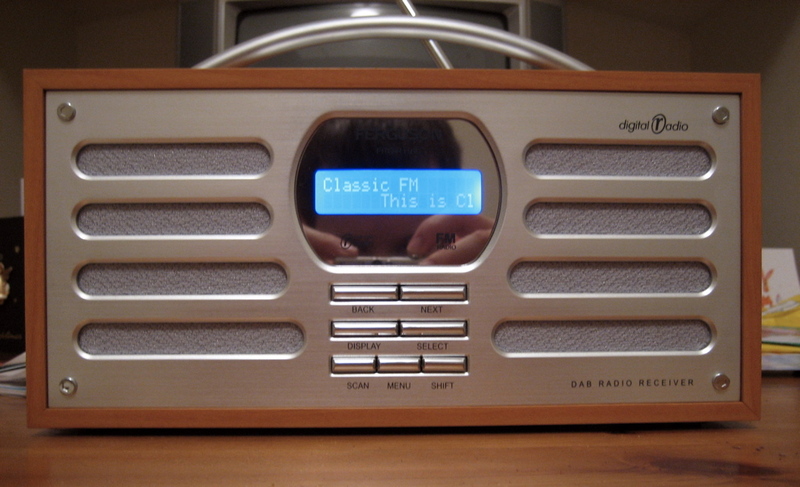 However, I do think DAB has a number of advantages over FM, namely tuning into stations is considerably easier, and the digital display gives all sorts of extra information such as the currently playing song. Another advantage of this model over many others in its class is that it allows up to 10 DAB and 10 FM stations to be stored as presets. While tuning is easier than FM, having only 4 presets for each of DAB and FM would have quickly led to an argument in this household! Not a major problem, but after a few weeks of usage I’ve decided the lack of visual feedback on the volume control is rather annoying.